Kevin’s staff was busy stocking the shelves once more. close to Holland and Holland, the clothing and guns. when everyone headed home Christmas Eve night. the staff called Kevin and Kathleen to see what was the matter. as they shone like midday on objects below. but a whited bearded old gent, without his reindeer. they realized it was Santa which made them quite glad. around the shop twinkling, he knew what to do. Santa moved with great speed as he moved through each aisle. he filled his great bag and it grew very tall. he had found all of the presents for his good girls and boys. he came down the steps and slowed down for short little rest. the red coat was for Christmas, only for show. He kept trying on clothes until it was time. then looked at our muck boots and knew they would do. and then checked out the camo and several duck calls. warm feet were a priority especially for elves. He closed up his bag, and then turned with a jerk. And a sleigh with eight reindeer arrived for his dismissal. With a quiet, quick cadence, they knew what to do. everyone wanted Kevin’s this year , so my work is now done. 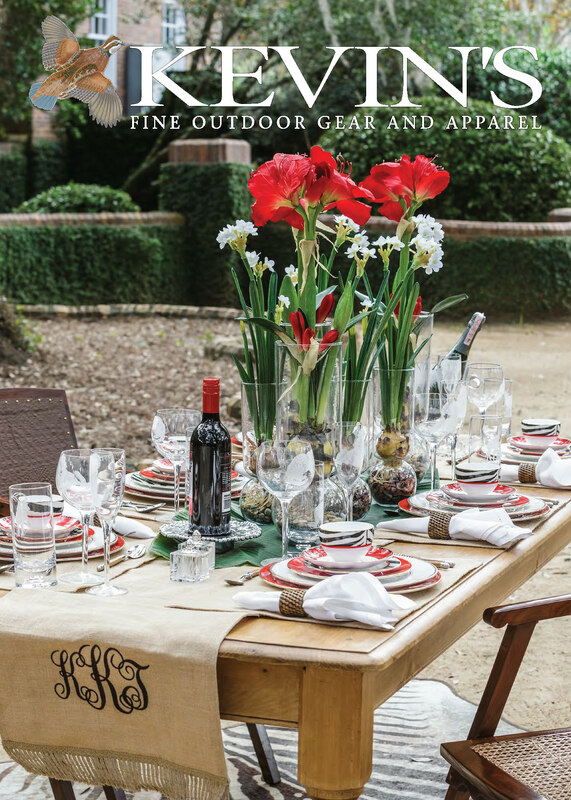 Eighteen years ago, two patrons of the arts and outdoor enthusiasts transformed Thomasville, Georgia into a national center for the arts, in celebration of the outdoor lifestyle. Now a nationally renowned wildlife arts festival, the Plantation Wildlife Arts Festival www.pwaf.org appropriately coincides with the opening of quail hunting season. The quail defines much of the southwest region of Georgia and the love of the outdoors, dogs, hunting, conservation, family and tradition. Inspiration came to founder Bob Crozer, while attending game fairs in Scotland and England. He felt Thomasville had the same love of the outdoors, family, wildlife and dogs that were celebrated in these festivals. Bob was fascinated and especially loved the majestic birds of prey demonstrations at the different festivals along with the different artist interpretations of outdoor life. His hope was that the people of Thomasville would feel that same joy he felt after attending these fairs. He knew in his heart that the community would embrace a similar festival. Inspired, he felt the perfect person to champion this wildlife festival would be his friend Margo Bindhardt – a woman who was passionate about the outdoors, a patron of the arts and a woman who knew how to create magic! Bob Crozer Co-Founder of PWAF had a great love of the outdoors. Kevin’s Fine Outdoor Gear & Apparel shares the same goals of the original and current PWAF efforts. “My mother always believed that volunteers, committees, and underwriters were the backbone of the festival” reflected Lousie and Kathleen Kelly, co-owner of Kevin’s follows this same belief. Like most working mothers, Kathleen juggles work and family but is committed to the success of PWAF and helps whenever possible. In the beginning years, Kathleen was an integral part of the Preview Party, even working as Chair. This special event allows people from all over the country who love fine wildlife art to preview the artist’s work in a less crowded environment than the actual daytime festival. It is the “kickoff” to a fun weekend and many of Kevin’s customers love going to the party. 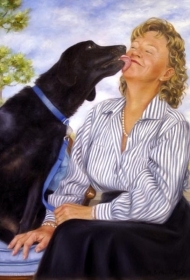 Kathleen’s favorite part of the evening is that old friends and customers of Kevin’s have an opportunity to enjoy a relaxed evening of art and friendship, talking about art, hunting, their families and favorite dogs. 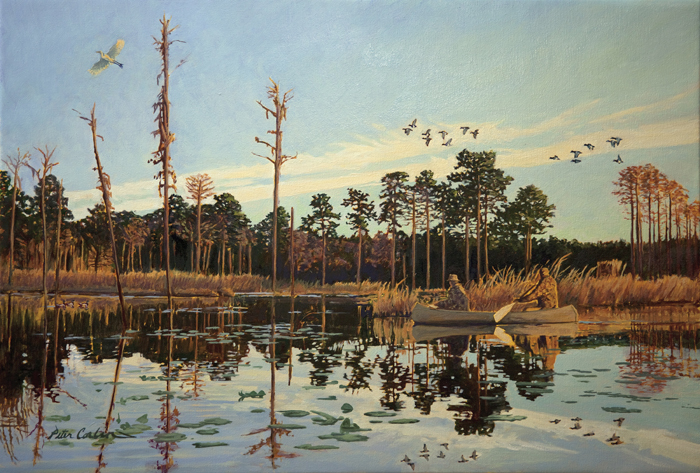 Featured PWAF painting “A Good Morning” by featured Artist Peter Corbin for the 2013 Plantation Wildlife Arts Festival. Kevin’s, in support of PWAF is again excited to participate in the festivities. Friday, November 15th during the Underwriter and Patron Parties, Kevin’s will present the prestigious gun manufacturer Holland and Holland and display some of their finest guns. As a kickoff to the quail hunting season, the artistry and craftsmanship of these guns truly has a place in the Plantation Wildlife Arts Festival. They are a work of art. To Kevin and Kathleen Kelly, Plantation Wildlife Arts Festival really reflects who they are. It speaks about their love of the outdoors , their support of the arts, their support of the PWAF beneficiary Thomasville Center for the Arts www.thomasvillearts.org and their commitment to Thomasville. 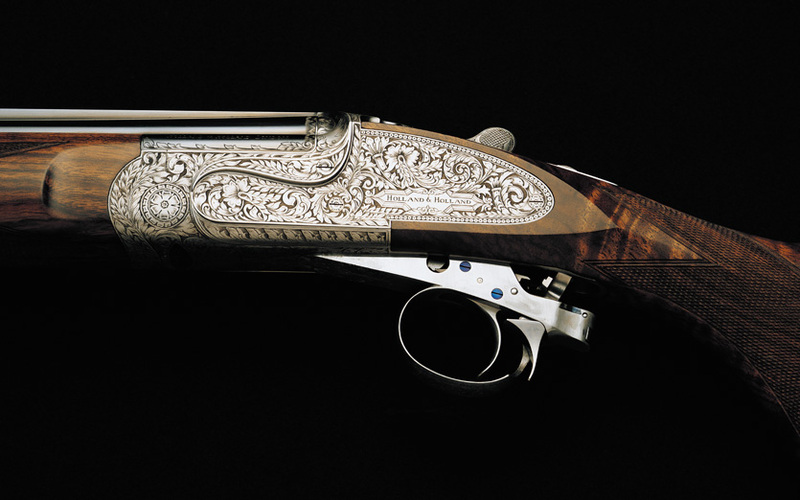 Featured during the PWAF Underwriter and Patron’s Party, Holland and Holland will showcase some of their finest guns – works of art. The core success of this special festival really harkens back to the vision and passion Bob Crozer and Margo Brindhart brought to it from its beginning. They planted the seed and gave the festival deep roots to sustain and grow over the years, and it now has a renowned status in the wildlife art world. Very sadly, both Bob and Margo have passed on, but their joy and spirit combined with their love of the arts, outdoors and Thomasville continues to shine on. For tickets and information please visit www.pwaf.org.